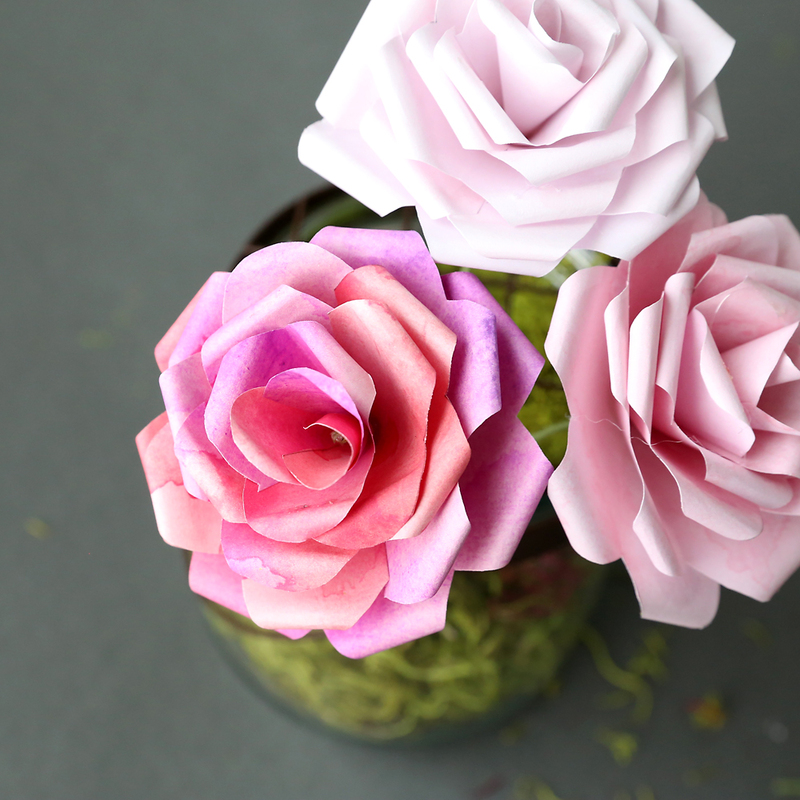 In today’s post: Learn how to make gorgeous paper roses with this free paper rose template in five beautiful colors. Hello, my name is Autumn, and I kill plants. I think it’s the whole have-to-water-them-regularly thing. I just kind of never get around to doing that. I actually get quite a lot of things done each day, but the way I do it is by not getting around to doing other stuff, like signing my kids’ reading minutes charts or cleaning out the basement or, apparently, watering our plants. Something’s gotta give, right? Hence: flowers made of paper. 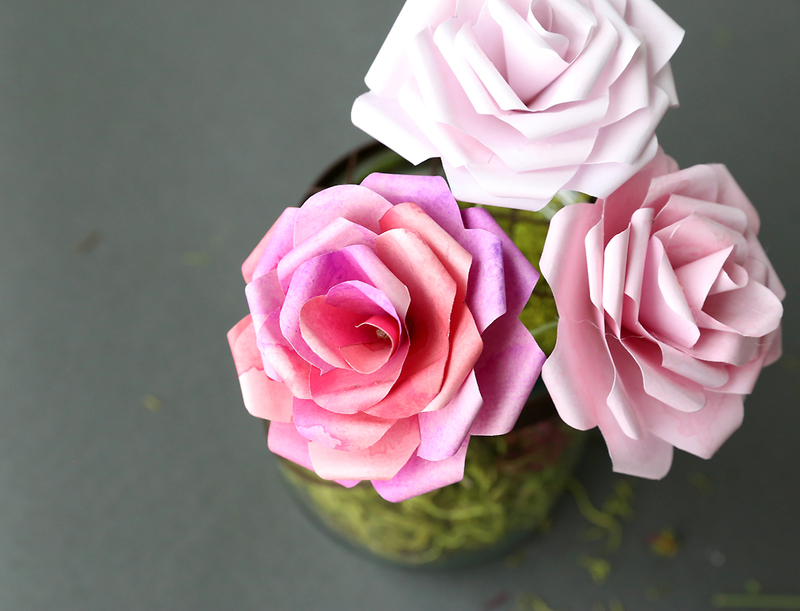 I saw a tutorial for making paper roses at Capitol Romance years ago and decided last week to finally give it a try. I wanted my paper roses to look somewhat realistic, which meant I needed to use paper that was colored on both sides. The only problem is that most pretty printed paper is only colored on one side. Gorgeous, right? And, happily, it won’t die when I neglect to water it. 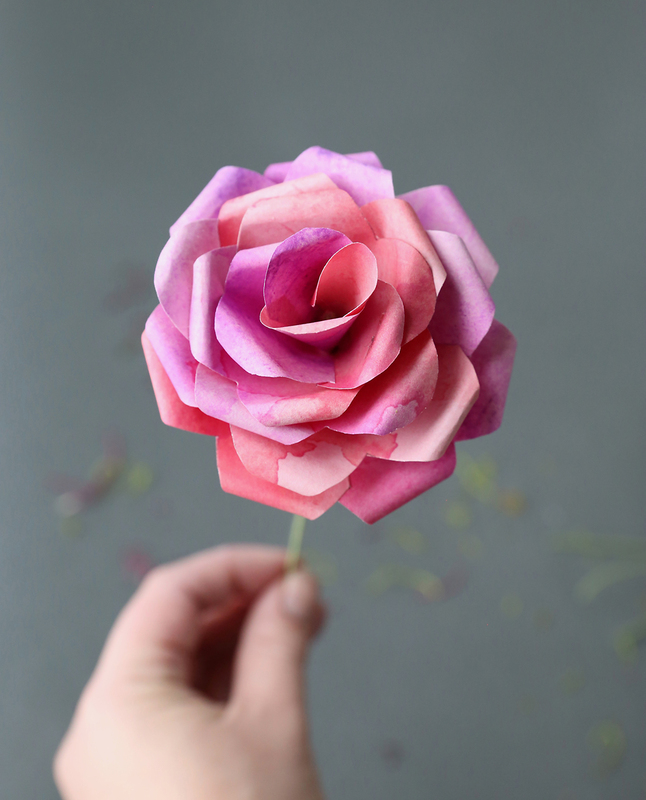 Watch this video to see how to make a paper rose. Written instructions follow. 1. 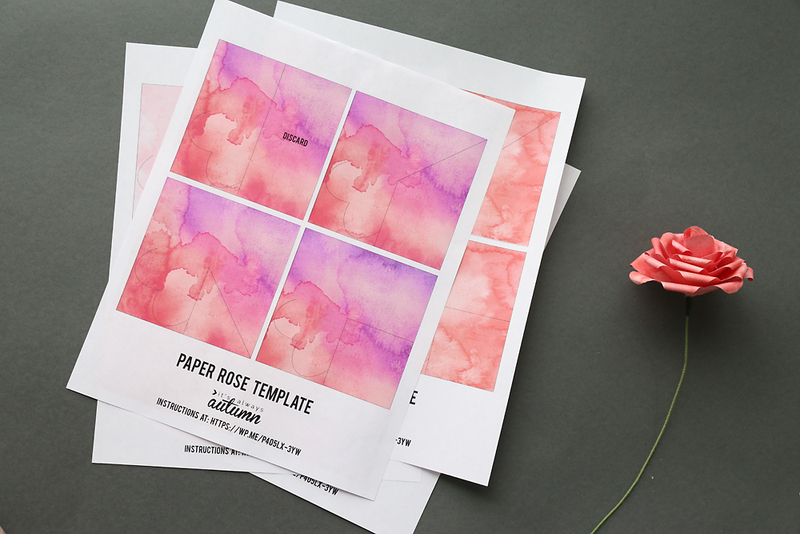 To make a paper rose, begin by printing a template on both sides of a piece of printer paper (not cardstock). Cut out each of the four squares on the paper rose template. Fold each square in quarters, making sure to keep the curved lines on top. Cut along the curved lines. Also snip off the corner or point of the heart to make a small hole. 2. Open up the papers and you’ll have four “petals”. Each petal has lines on it. Cut along the lines. 3. Discard the piece of paper that says “discard”. Now you will have 7 pieces: one with seven petals, one with six, one with five….all the way down to one with one petal. 4. Take the first piece and glue along one of the cut lines. Overlap the other cut line slightly and press together to adhere. 5. Repeat with all the pieces except for the one-petal piece. For that one, just use a toothpick to help curl it in on itself. 6. Roll the edge of each petal around a toothpick to curl it outward. 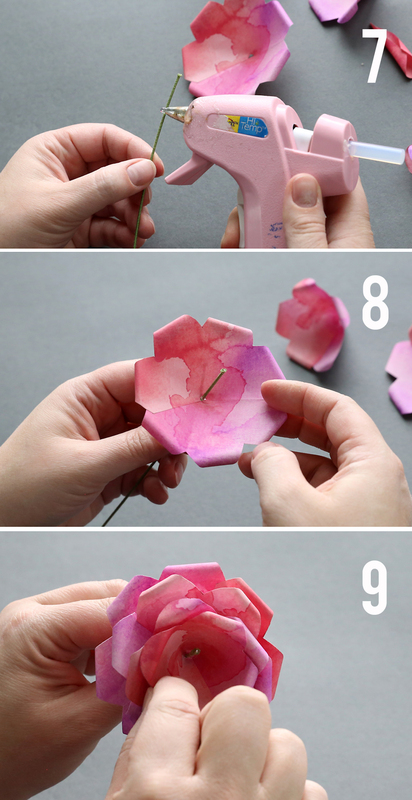 You now have 7 sets of petals that you will layer together to make a paper rose. 7. Place a dot of hot glue about 1 inch from the top of a piece of floral stem wire (or any other wire). 8. Slide the biggest petal onto the stem and down to the dot of hot glue. Add more hot glue if needed to secure it to the stem. 9. Place another dot of hot glue inside the first petal and slide the next largest petal down on the stem. 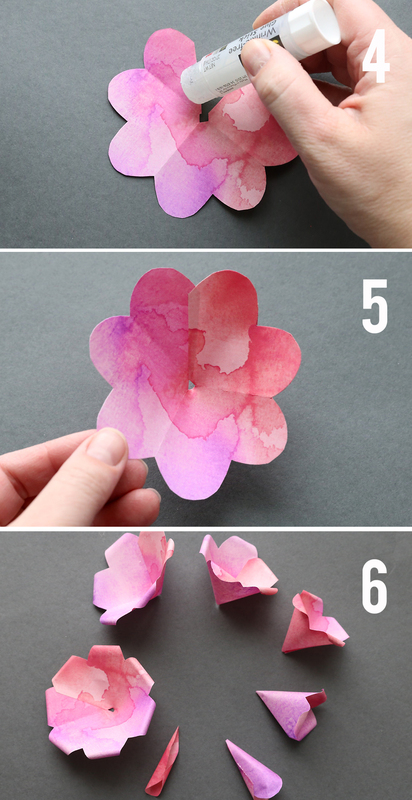 Add more hot glue and the next petal, and continue until you have added all the petals. 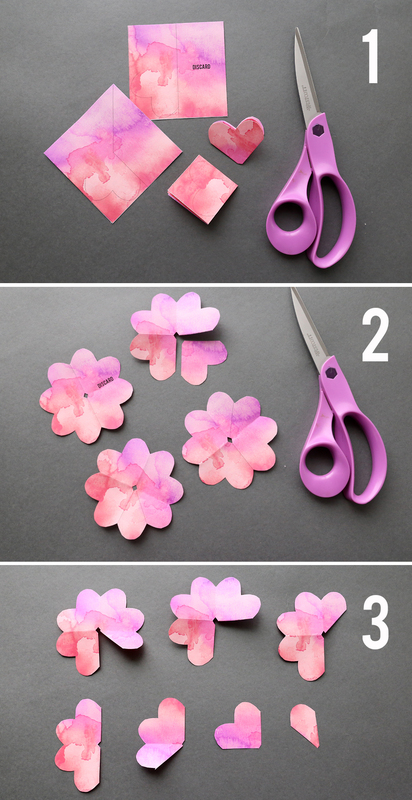 As you add petals, position each one so the petals don’t completely line up with the ones below it for a more natural look. 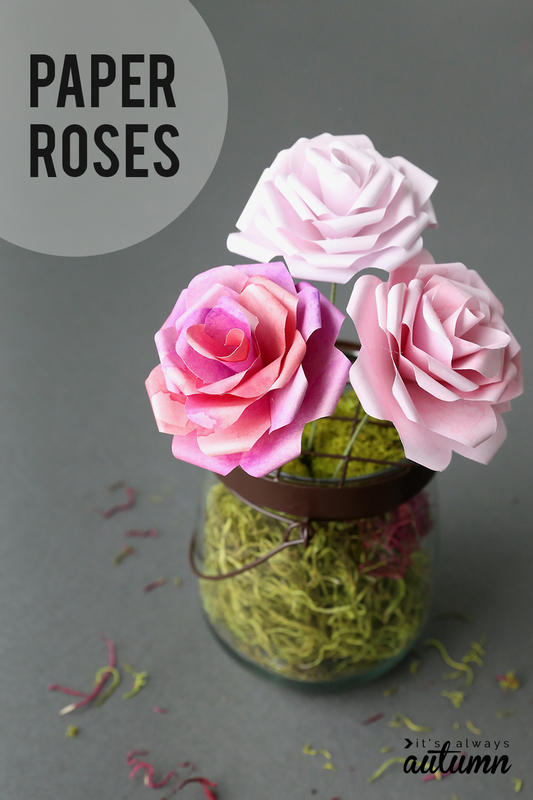 You may finish off your paper roses with some floral stem tape if you like (I didn’t). I have a vase of these sitting up on a bookshelf and I love the touch of color they bring to the room. A whole bouquet of paper roses would be beautiful! Really pretty Autumn Ill try it with my granddaughters. Thank you for writing this up and making the video. I made a bouquet of 12 to send my wife who is overseas. Hopefully they survive the post offices. Thank you for putting this tutorial together! As a fellow plant killer 😉 I look forward to having blooms that survive my lack of attention. lol. Thank you so much for this tutorial. I just could not master any other rose tutorial till I found yours. Now its the only template I’m using and my book page roses look lovely! Some reallү nice stuff on tɦis web site, I like іt. Thanks very much for making this tutorial and templates! I can’t wait to try it! Merci pour ce super tutoriel. Les roses sont très faciles à réaliser et semblent plus vraies que nature!